This Thanksgiving Day, I bless Daniel, my husband and best friend, for his constant love, support, companionship and inspiration. While I am studying and writing papers in the library, he sometimes makes surprise visits....sometimes with hot coffee, sometimes with a kiss, and sometimes just with his reassuring quiet presence so I don't feel alone. This is true in life as well. 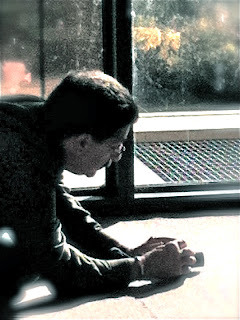 Here during one library visit, he got down on the floor to capture a composition of shapes that caught his artistic eye. He, too, is a seer. We like our solitudes as well as our togetherness. I never take him for granted, and am grateful for him every single day. Thank you and bless you Daniel, for all that you are. It's the high season of tree love for me, so I thought I'd belatedly share some pages from a fantastic Tree Journal workshop I participated in this summer with Orly Avineri, a wonderful artist, teacher and friend whom I love deeply. On this, my birthday, I celebrate the cycles of life. 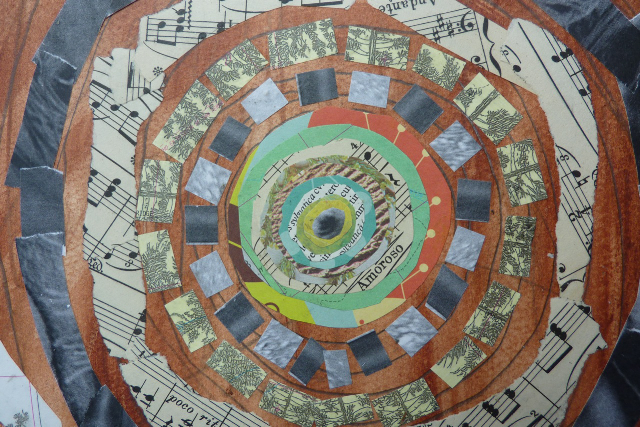 Like the concentric circles on a tree, my aging creates a pattern unique to me, a mosaic of lines, pictures, patterns, words, people, places, memories. 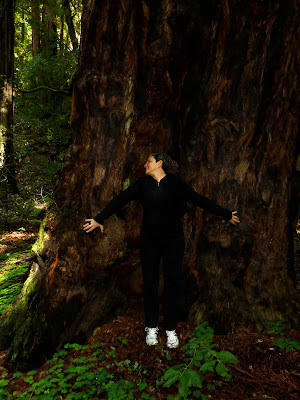 I am happy to be alive and healthy, awake and present to the swirl of life in me and around me, blessed with a roof over my head, tall old trees all around me, people and animals I love, art and writing that inspires me, study and learning that feeds me. I am alive and here today with all my heart, and I am grateful. I have always felt safe and at home among trees, our wise green elders. They know how to naturally bend and sway when there’s trouble in the air. They have seen it all and even so, they endure, they persevere. They teach me to do the same. One week ago, trees in the northwest suburbs of Chicago were put to the test when a huge storm swept through just before 8:00 A.M. I was on my way to Camp Courage, to be a first-time counselor at this five-day camp for grieving kids, offered by Hospice and Palliative Care of Northeastern Illinois. Within one mile of the camp, the sky darkened and I watched trees dancing an unhappy hula against the black sky. The rain began stinging my windshield as I entered the long road in. Advised to park down by the lake, I heading in that direction and on arrival, realized there were no other cars or people present. The rain pounded the windshield and I felt like I was slowly moving through Earth’s giant carwash. Struggling to see through thick, wet glass, I parked next to a small shed and turned off the ignition. For ten minutes, I sat in my car as the storm raged relentlessly, until a voice behind me shouted, “Come with us, we’ll drive you up!” Grabbing my backpack, cell phone, keys and emergency rain poncho, I threw myself in a small car with four other people I didn’t know, relieved to have company. As I entered the cabin where staff was to meet, two counselors were covering tables with paper and setting up art supplies in the dark. Power was gone. 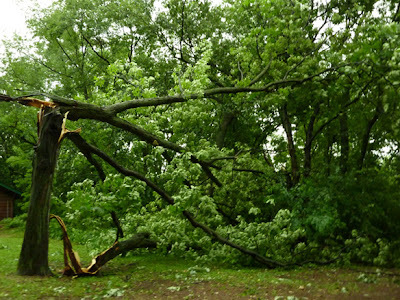 Outside, within fifty feet of the cabin on either side, two additional trees had snapped, and the counselors had seen them fall. 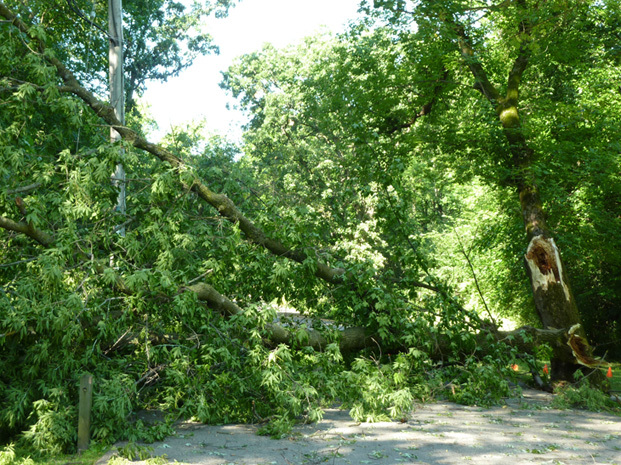 All over Camp Courage, trees were down and power was out. But one by one, the counselors appeared, as did almost 40 kids between the ages of 6-14. Shyly but bravely they arrived for this journey to explore their feelings of loss. Grouped in small teams according to age, they rotated among art making activities, talking and sharing, team-building exercises in the woods, on water, and on land. They climbed a rock wall to build self-esteem, and told stories about loved ones lost: sisters, brothers, parents, grandparents. Interspersed with grief work were more traditional camp activities like singing, flag-raising, and lunch on the grass, often followed by a spontaneous game of kickball or tag. For five days campers played, had fun, were safely guided to share memories and feelings, and in so doing, bonded with others like themselves. Healing was in the air. Meanwhile back at home, ours was one of over 800,000 households without power. A 15 minute storm had taken down so many trees and power lines that help was being called in from other states. I couldn’t complain. I was grateful to have a home, a loving husband, and two adoring pets. We dragged out coolers and filled them with as much food as would fit, packing them in ice, throwing away what would spoil. The next morning, my husband and I made coffee in the fireplace, grateful for what we had, not thinking about what we’d lost. 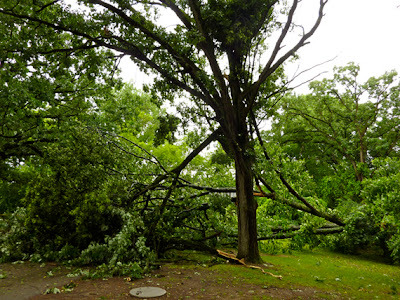 The storm lasted 15 minutes, but our electrical powerlessness lasted six days. Each day I’d awake, look at my bedside clock hoping to see green digital numbers signaling power restored, but no luck. We made our daily ice runs and gave our daily thanks, wanting to keep things in perspective. One night, we made a stir-fry for dinner in the fireplace, using food we had rather than being wasteful. We read with camping lights attached to our heads. Losing electricity is inconvenient, but temporary. Other losses are permanent. In About Grief, Marasco and Shuff eloquently describe grief as “the weight of never.” Facing the loss of loved ones requires immense courage. All things are fragile, people and tall trees. One minute they’re towering above us, strong; the next minute, they’re lying prone at our feet. A storm comes from nowhere, knocking them down, knocking out pathways and power, leaving everything broken in the aftermath. Why did this storm happen at this time, at this place, where we’d gathered for this reason? There are no accidents. Our lessons are everywhere, if we are attentive. Trees. Courage. Loss. Power. What’s important is to endure and persevere. I lost a few months here, in the adjustment to being back in school, but now I'm back here, back to myself again, and happy to be here. This is a sketch I started during one of my classes (Intro to Addictions). It has been many, many years, perhaps even decades, since I enjoyed the simple pleasure of sketching from observation with a pencil. This was a solid graphite pencil, so it was very soft and responsive to the subtlest pressure. 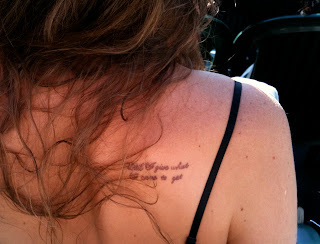 I found myself getting very involved with every single line in my skin, which there are many more of these days. My fingernails are full of ridges and flaws beyond repair. As I noticed each detail and recorded it, I accepted it without thought: just another detail of me. I enjoyed being with all my imperfections, and I like this drawing, exactly as it is. I am not going to complete it. It is perfect as it is: imperfect me, now, in the process of life and aging. I'm in Week 6 of Grad School. Not sure what to think. A lot to stay on top of and a lot I feel unsure about. But showing up every day. Here are some things I've been seeing that I like. First, from the train one morning. Then, on a building window...grossness and beauty coexisting. 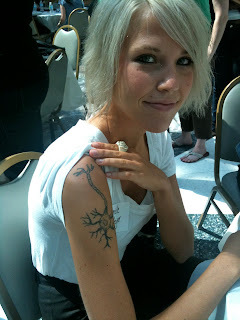 And my favorite two tattoos at school: a NEURON; and a great quote: "Until I give what I came to get." Inspiring. More to come. It's been a few weeks without a post, because I was waiting for "an idea" before posting again. In advertising, we are idea machines....that is what we're paid to do, come up with ideas, lots of them. And always, while doing our damnedest to be creative, these ideas are a solution to a problem, some creative way to interpret or express a very carefully researched, strategized, crafted point of difference about a product or service. Then I remembered that was not was this is about. I started this blog to hold myself accountable on a new path, a truly creative path, into the truth of the moment, whatever that may bring. To have the courage to dive naked into my deepest creative self, and the creative spirit in others, as I pursue a course of study in Art Therapy...which by the way, begins next week. September is upon us. This time of year always stirs things up for me. I've experienced a lot of messy, scary, complicated and confusing emotions lately that I didn't want to feel or explore. But that is the promise I made to myself, to this blog, and to my future. And the future of all those I hope to work with one day. If I don't want to "go into the room" myself, how can I help anyone else go there? So yesterday I picked up my oil pastels, which I am not too comfortable with, and made myself work fast, trying not to think. I made the chaotic swirl of confusing feelings fly through fingertips onto paper. My hands got messy and happy. I liked the smell of the materials and the feel of the paper. I made a mess. And I felt a lot better. I am in the room, and it is OK. 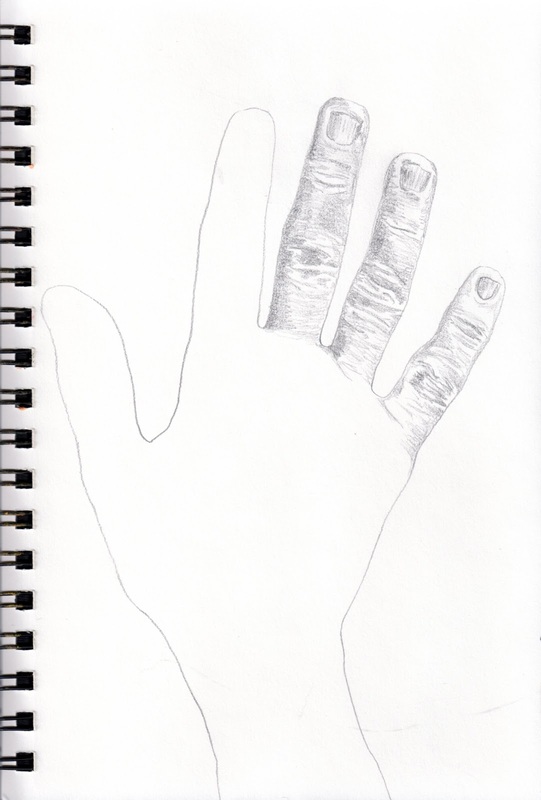 I'm an artist and writer who is shifting gears in midlife and excited about it. I love journaling, drawing, collage, photography, mosaics, mixed media and fiber arts. I am also interested in creativity and the aging process. Stay tuned.